Charlie Walker (SOS Femme en Danger – SOSFED): Charlie completed an undergraduate degree in International Relations and French at the University of Leeds. Charlie earned a Masters degree in Post-War Recovery at the University of York, and her research took her to the Eastern Congo where she encountered SOS Femmes en Danger (SOSFED). Charlie has also worked with vulnerable migrants in Spain and Britain, and with the British Red Cross. 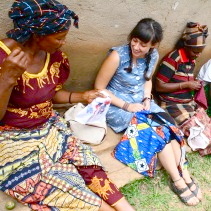 After her fellowship at SOSFED, Charlie wrote: “Perhaps the most significant cultural understanding that I gleaned from the experience was a deeper knowledge of the position of women in Congolese society, and of the value of women’s rights education to empower women and encourage their husbands, fathers and brothers to support such a process of empowerment." Kabila Comes to Uvira: “Votez! Votez! Votez! KA! BI! LA! SOS FED in Mboko: Water, Risk Reduction and PRIMUS! Grassroots South Kivu, the Congolese Government and the International Community: Empowerment and Self-protection vs. Neglect?